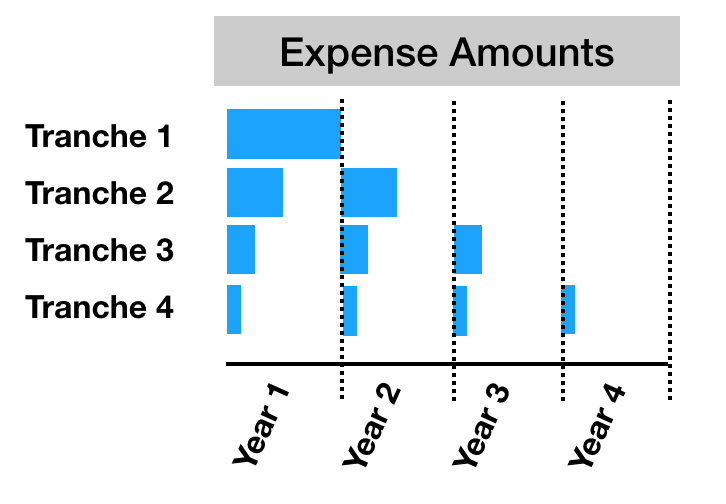 Who can use expense reporting? Carta’s expense reporting tool is built to comply with accounting standards codification (ASC) Topic 718 and 505-50 related to stock based compensation under US GAAP. We use your fiscal start date and reporting period in order to automatically calculate your expense reports. While setting up your reports, you can choose to have annual, quarterly, or monthly reports. Determine your amortization method for the grant date (employee awards) and mark to market (non-employee awards) reports. Carta supports the Straight-Line and FIN-28 (also known as the accelerated or front-loaded method) amortization methods. Additionally, the expense reports use the graded-vesting method which breaks out each award’s vesting tranches to allocate the expense amounts. If you have never recorded the stock based compensation expense before, consult with you auditors on which amortization method to apply. If you have recorded the stock based compensation expense before and would like your ASC718 reports to remain consistent with historical periods, please select the amortization method used historically. Grant-date methods apply to employee awards expensed under ASC 718. These securities are valued at their grant date. Mark-to-market methods apply to non-employee awards expensed under ASC 505-50 in which grants are revalued at each reporting period. It is important to note that as of July 2018, the FASB released an update to the Accounting Standards Codification. Refer to this article for further information on how this may affect you. Carta's Expensing Tool uses the Intrinsic Valuation Method to value all restricted stock awards, as the fair value cannot be reasonably estimated using the Black-Scholes Model due to the complexity of these awards' terms, particularly in regards to the expected term. Carta believes this to be consist with ASC 718-30-30-2. For the intrinsic value method, you may select to use the Issue Price (such that the awards' value will be equal to Fair Market Value of Common on the grant date - Issue Price) or if you would like it to default to $0 (such that the awards' value will be equal to Fair Market Value of Common on the grant date - $0). Consult with your auditors if you are unsure which method to select. We now have a setting on whether you would like to include the vesting date as part of the service period for expense attribution. For our migrating customers, we recommend continuing to expense using the “service period includes vest date” method. Selecting "Yes" for service period includes vesting, would cause the expense to be allocated over the number of days in each vesting tranche plus 1 day. This method makes the assumption that vesting conditions occur at the beginning of the day, while record keeping for accounting purposes occurs at the end of the day. Alternatively, if you select "No" here, you will be making the assumption that vesting and record keeping for accounting purposes occur at the same time, thus allocating the expense over the number of days in each vesting tranche. 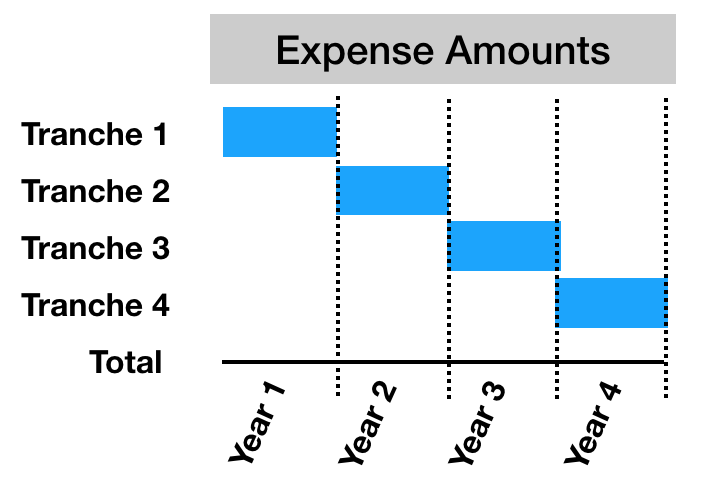 In order to deliver a complete report of your stock based compensation, we need to calculate all prior period expenses. Our tool will automatically identify the beginning of your equity plan as the issuance date of your earliest issued award and ensure all periods are calculated. If you have previously been audited and had the stock based compensation expense recorded through internal spreadsheet or another software provider, you will want to upload your assumptions used historically in the Black-Scholes Option Pricing Model. Reach out to 718@carta.com and an analyst will be able to assist you will this upload. Our new tool now allows companies to select their peers for their own specified period rather than tied to a specific reporting period. For example, lets say you received a 409a valuation for October 1, 2013 until September 30, 2013 but your fiscal year end is December 31, 20XX. The public peer group from the 409a will be effective as of October 1, 2013 and will be applied to both a portion of 2013's annual report and 2014's annual report. Once this input is collected, Carta will calculate the volatility for each individual grant based on the grant’s expected term and issuance date. All historical daily pricing information is pulled from our third-party data provider, CapitalIQ. 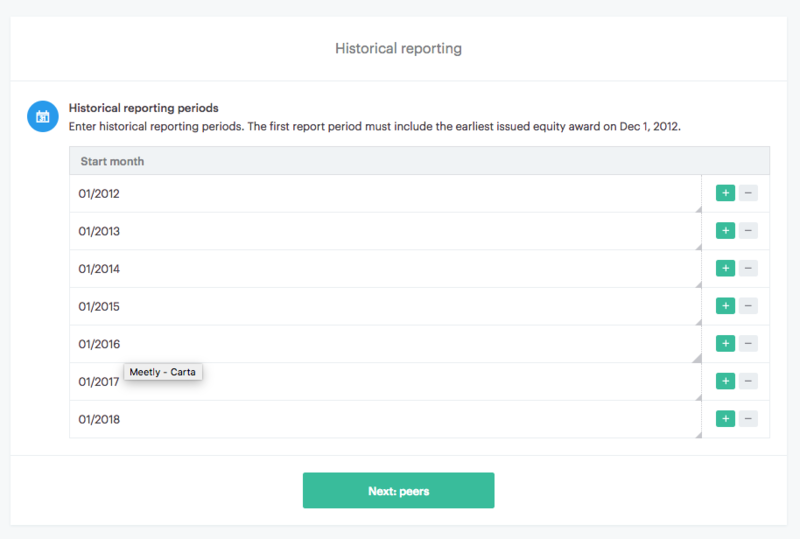 In order to generate the expense reports, an accurate record of the historical 409a fair market value (FMV) must be saved on the Carta platform. The FMV is used as an input into the valuation models used to value the option grants and restricted stock. As such, this information is crucial to record the accurate expense amounts. The Carta Expensing Tool uses the FMV information that is stored on the 409a page under Compliance. You can add non-Carta board approved fair market values to the 409a page by following the directions here. In addition, you can edit, delete, or add FMV’s specific to expense reporting purposes at anytime, even after reports are generated. All of these changes can be made directly on the fair market values table in your Settings under Compliance >> Expense reporting. Please note that in order to successfully generate the expense report, you will need to make sure that a FMV is listed on this page that covers the date of the earliest issued award. For companies that did not have a third-party conducted the 409a at this early stage, a board approved FMV is sufficient. You can add additional FMV's for expensing purposes here using the green + option or delete FMVs that do not apply. If you have Black Scholes assumptions from another software provider or internal spreadsheets that you would like to use rather than our calculations, we have a tool to import these values onto the platform. Please contact us at 718@carta.com to migrate them over.